Banks Peninsula is home to an endangered tree weta rather imaginatively called the Banks Peninsula tree weta (or Hemideina ricta to its friends). This species is only found on the eastern edges of the peninsula and there is a concern that its range is still shrinking. Lincoln University scientists have an active role in conserving this species. Aside from the usual cuplrits, like habitat modification and introduced predators, a major reason for the decline of this species is another tree weta species, the Canterbury tree weta (Hemideina femorata). It is thought that the two species are able to mate and produce hybrids. Why is this such a problem? Hybrids are obviously not 'pure' individuals of either species. If too much hybridisation occurs then there may be few pure Hemideina ricta left (and certainly it will be hard for these individuals to find pure mates). Conversely, the Canterbury tree weta is found throughout.... well Canterbury and has a large population. Only a small proportion of the Hemideina femorata population will become hybrids and most matings within the region will be between pure members of the species. 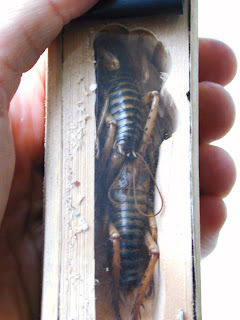 Obviously it would be useful to be able to identify which tree weta are hybrids but it is not always easy. However, you can't fool DNA. Roddy Hale and Gregoire Alabergere from Lincoln University have worked with Marie Hale (University of Canterbury) to identify useful sections of DNA that will identify which species parents of weta found in Banks Peninsula belong to. The idea is that some parts of the genome (the entire DNA found in an individual) change at such a fast rate that some versions are only found in one species and some in the other. In a study recently published in the journal of Conservation Genetics Resources, they showed how they had looked at 20 microsatellites (fast changing regions) from the weta species and found that 12 of them were useful for identifying which species the DNA came from. With these new tools scientists will be able to survey tree weta populations and get a better feel for the scale of the problem facing Hemideina ricta.